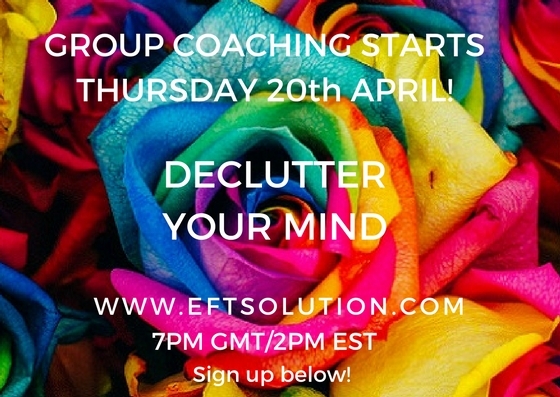 Thank you for enrolling in the EFTSolution.com 3 week group coaching! You are now successfully enrolled and I look forward to sharing the course information with you. Keep a look out for the emails as the course content gets loaded on the site and make sure to 'whitelist' the emails. In this group training, on 13th April we will discuss 5 key ways to declutter your mind for more peace, clarity and harmony in your life. We will also go through a short eft/tapping sequence. There will be a follow up email for 2 days after each training to settle your energy. Further details and the link to the group coaching will be provided on email. PREFER 1-1 Coaching? Click Here. This week we will discuss how self sabotage could be affecting your life, what it feels like and what to do about it. We will also go through a short eft/tapping sequence. There will be a follow up email for 2 days after each training to settle your energy. Further details and the link to the group coaching will be provided on email. In the final coaching of the series we will look at 8 potential limiting beliefs you may have and what to do about them. We will also go through a short eft/tapping sequence. There will be a follow up email for 2 days after each training to settle your energy. Further details and the link to the group coaching will be provided on email.